Growing seasons of United States regions are also referred to as growing zones, hardiness zones, or gardening zones. Gardeners searching for information on growing seasons of United States areas are really looking for guidance on what to plant and when to plant it. Understanding growing seasons and gardening zones is an important first step to deciding which plants to grow, but there are many subtleties and nuances experienced gardeners recognize as essential for successful gardening practices. Throughout the centuries, gardeners relied upon nature's cues to prompt them to plant and harvest crops. The size of tree leaves, the appearance of certain birds, insects and animals, weather patterns and rain gauges told the smart farmer or gardener when it was warm enough to set out tender plants and when he should start harvesting the crops. Today, gardeners rely upon gardening zone maps to understand the growing seasons across the country. Commercial greenhouses and reference books also use growing seasons and hardiness zones as a standard guideline, making it a lot easier for novice gardeners to determine what to plant in their backyards. As the demand grew for a standardized method of identifying potential plants for a region, two independent groups decided to study the weather patterns and historical record and develop a map that provided the estimated growing seasons for a particular region. The U.S. Department of Agriculture and the Arnold Arboretum and Harvard University each independently tackled the project, which resulted in two separate, although roughly equivalent maps. After many years of having two similar yet different maps, the USDA revised their maps from climate data recorded from 1974 through 1986 and issues a brand new growing seasons of United States region map in 1990. This is now the standard map in use today. You can visit the United States Department of Agriculture to look up your own specific zone. There are 11 zones in the United States, with the majority of gardeners living between zones 4 (northeastern and northern portions of the United States) and zone 9 (southern). It's nearly impossible to list the growing seasons and zones and the states they encompass since many cut right across state lines, and some states may be part of multiple zones. Use the USDA's site to pinpoint your own unique zone and determine the growing seasons for your region. The USDA hardiness map provides extremely useful data. Generally speaking, the growing season extends from spring through fall, with the last date of frost in the spring and the first date of frost in the fall marking the boundaries of the growing season. Yet growing seasons vary according to many factors. Elevation, for example, shortens the growing season slightly because of cooler temperatures. Micro climates created by natural undulations and contours in the landscape may make an area warmer year-round or more prone to frost. Man-made objects such as brick walls, houses, barns, and sheds can also create microclimates. 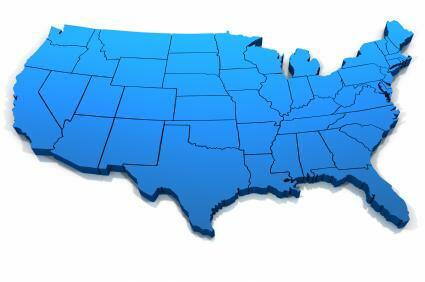 Determine your gardening zone using the USDA map. Use the zone as a guideline for choosing plans. Always consult the maps printed on the back of seed packages and follow the guidelines of when to start seeds indoors or plant outside. Consult a reputable plant encyclopedia to find the hardiness zones for plants you're considering. If purchasing plants from a website or gardening catalog, note the hardiness zone or growing season number suggested by the company. If you're new to a neighborhood, look at your neighbors' gardens and note what grows well. Talk to your neighbors or join a local garden club to learn more about what thrives in your area's particular microclimate. Growing seasons of United States regions generally include spring, summer and autumn, but areas in the warmer portions of the country may include the winter months, too. To determine which specific plants you can enjoy in your garden and when they can be moved outdoors, consult the USDA hardiness map, a plant encyclopedia, website or grower's catalog. Following these general guidelines and your own personal observations of your garden's micro climates, you'll learn what to plant when and grow a beautiful garden.